Available in four designs; penguin, owl, football and union jack, these great value speakers will make a brilliant stocking filler. Compact and portable, they connect to most sources via a 3.5mm headphone jack and can be recharged easily using the included USB cable. This splash proof shower radio has a digital timer so you can set how many minutes you would like it to play for. It will then automatically count down and turn off. The radio has a matt texture on both sides so you can move it with wet hands and the bottom of the radio is also rubberised allowing you to press the buttons easily, without it slipping. Click here to continue reading about great Christmas gift ideas. AUSTIN, TX, August 21, 2012 /24-7PressRelease/ — With the tea market growing 12% per year for the last 5 years, electric kettles will be the hot holiday gift in 2012. Known simply as the “Ekettle”, this item by Chantal will bring bold color and fresh style to a traditionally utilitarian category; making it the perfect gift during the holiday season. Contrary to the pitcher style shape that has dominated the electric kettle world, the Ekettle offers the comforting look of a stovetop kettle. It is offered in four different finishes including stunning Chili Red, Indigo Blue, Brushed Stainless Steel and Onyx, Chantal’s brilliant metallic black. It has a 52 oz. capacity and a Suggested MAP Retail of $79.99. The Ekettle is available at Bloomingdale’s. Click here for more information on this holiday gift idea. SAN MARINO, Calif.—A major gift in support of the Chinese Garden at The Huntington Library, Art Collections, and Botanical Gardens is enabling the institution to move forward on the much anticipated second phase of the landmark garden’s development. Click here for more information about this charitable giving. HOLLYWOOD, Florida — May 20, 2013 – After successfully leading the Diabetes Research Institute Foundation (DRIF) for two decades, Robert A. Pearlman, 67, of Boca Raton, FL, announced that he will be stepping down from his position as president and CEO effective June 30, 2013. Click here for more information about this press release. n an unprecedented series of events on five continents, almost 5,200 families who are winning their own battles against hunger and poverty are preparing to help their struggling neighbors become self-reliant. From Nepal to Uganda, from Kosovo to Ecuador, from Indonesia to Zambia, families in April will donate dairy cows, dairy goats, alpacas, and water buffalo, as well as bees, trees, and seeds, to their struggling neighbors. In turn, the families who receive the donated resources pledge in time to also pass on the gifts – often the first offspring of their livestock – to yet more neighbors facing hunger and poverty. In April, the families will receive livestock and others resources during approximately 250 emotional and poignant Passing on the Gift ceremonies hosted by Heifer International in almost 30 countries. Click here to continue reading about this great, charitable gift idea. The Wildacres Writing Workshop is annual, residential, summer program held in the Blue Ridge Mountains of North Carolina. Classes include different fiction forms and creative nonfiction. Click here for more information about the writing workshop, including rates. Are you working on your first novel? Are you interested in learning what goes into writing a book? This weekend retreat covers several genres of writing. Click here for more information about the writing workshop. Click here to register for the writing workshop. Sunrise County Economic Council (SCEC) and Lora Whelan, assistant editor/publisher of The Quoddy Tides have teamed up to offer a press release writing workshop for area nonprofits, businesspeople and community groups. The 2.5 hour workshop will take place April 11 from 2:30-5 pm at the Machias CareerCenter. Cost for the session is $10 per person. Click here for more information about the press release writing workshop. Craig’s Killer Coffee – 1447 E. Lafayette St., Tallahassee, FL. Jet Set Lounge – 501 North Macomb Street, Tallahassee, FL. FOOD SERVED UNTIL IT’S GONE and free live music! Past events have included free live music from Crooked Shooz, Cheap & Easy, Swingin’ Harpoon Blues Band, and Scots on The Rock. 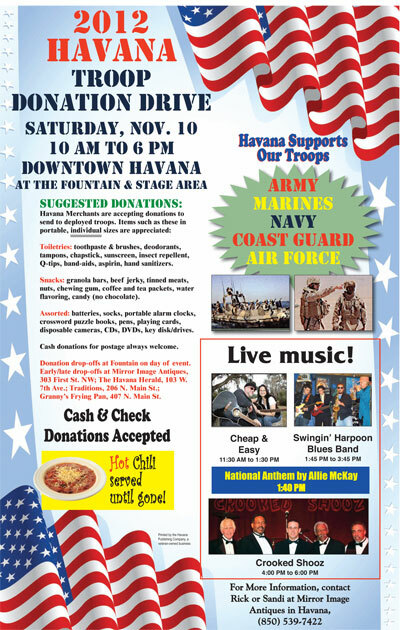 Veterans are on hand all day on Saturday to accept donations at the Fountain in the historic downtown shopping district of Havana. Bring your donations, listen to free live music, and enjoy shopping on our many antique stores, art galleries, restaurants, specialty shops, and furniture stores. Come spend the day! Donations all year can be dropped off in Havana at Mirror Images Antiques, The Havana Herald, Traditions, and Granny’s Frying Pan.